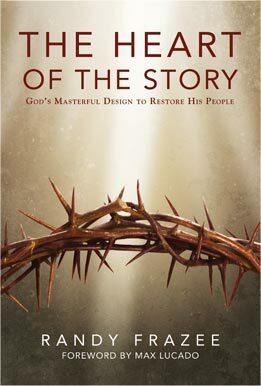 Do you know the overarching storyline of the Bible? I think of people in my church right now. learning basic bible stories since they have never read the bible before. Our church has many people who lack a basic biblical literacy that Christians have. They are new believers from unchurched background who are just now starting to read scriptures. Like the newest members of our church congregation, if you are not familiar with the story line of Scripture, The Heart of the Story would be a great place to start. I can imagine churches giving this book to first time church visitors, new Christians, or even in using The Heart of the Story in a seeker oriented class. It could also serve a rightful place in a Christianity 101 type class, or as a personal 31 day devotional. If you are just starting out in your Christian walk and want to have that big-picture overview of the narrative of Scripture, Frazee can be your guide. Along the way, Frazee makes several connections to our current life, particularly about how God can use ordinary and even unlikely people to advance His plan. You can also connect with Randy Frazee on his blog here or follow him on Twitter here. Zondervan provided me with a digital copy for review.